Scroll down to see the design concept details. The press packet .zip file contains the written press release for this design. It also includes aerial and perspective images in high resolution 3000 X 2400 or more. Click "View" to see the panel in high resolution detail. 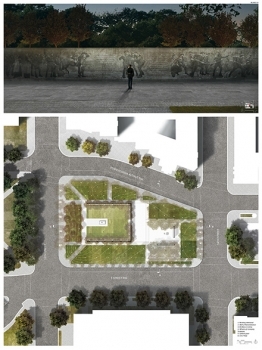 The allegorical idea that public space and public freedom are hard won through the great sacrifices of countless individuals in the pursuit of liberty provides the original design concept for this project. A memorial and a park built to represent this truth should pay homage to the loss incurred in securing these freedoms. 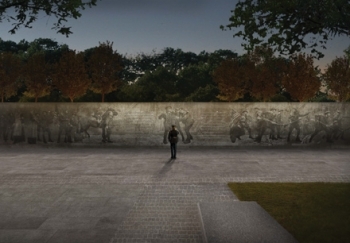 The raised figurative walls visually express a narrative of the sacrificial cost of war, while also supporting a literal manifestation of freedoms enjoyed in this country: the open park space above. 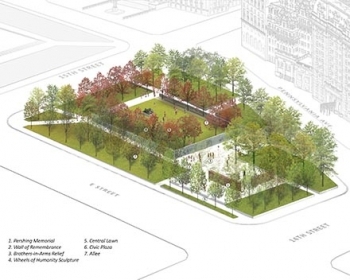 The urban design intent is to create a new formal link along Pennsylvania Avenue which ties together the memorial to Tecumseh Sherman on the West and Freedom Plaza on the East. 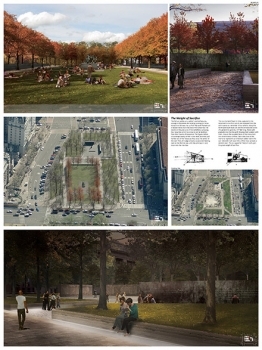 This is achieved by lowering the visual barriers surrounding the existing Pershing Park and reinforcing dominant axes that come from the adjacent context. 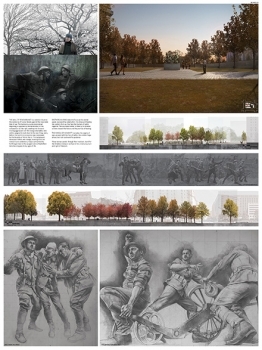 The raised form in the center of the site honors the veterans of the first world war by combining figurative sculpture and personal narratives of servicemen and women in a single formal expression. 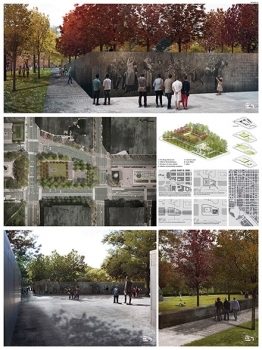 The integration of a park around and atop the memorial alludes to the idea that public space and personal freedom are only available through the sacrifice of our soldiers. Above all, the memorial sculptures and park design stress the glorification of humanity and enduring spirit over the glorification of war. These themes are expressed through three sources: relief sculpture, quotations of soldiers, and a freestanding sculpture. The figurative relief sculpture, entitled “The Wall of Remembrance,” is a solemn tribute to the resilience of human bonds against the inexorable tide of war. The 23 figures of the 81' relief transform from civilians into battered soldiers, leading one another into the fray. The central piece, “Brothers-in-Arms,” is the focus of the wall, representing the redemption that comes from war: the close and healing ties soldiers form as they face the horrors of battle together. The wounded soldier is lifted by his brother soldiers toward the future and the promise of healing. The quotation walls guide visitors around the memorial through the changes in elevation, weaving a poetic narrative of the war as described by generals, politicians, and soldiers. The sculpture on the upper plaza, “Wheels of Humanity,” recreates the engine of war. These are soldiers tested and bonded by the fires of war to each other and to the machinery they command. For all of the courage and heroic stature they convey, each looks to the other for guidance and a signal to action. The bronze medium used throughout stands for the timeless endeavor we face in the universal pursuit and right of freedom. A design competition is a far greater enterprise than a mere beauty contest. It provides a platform for the expression of ideas and innovation as well as an opportunity for research and exploration that transcends everyday practice. The goal of a well-conceived and executed design competition process is that everyone involved (participants, jury, sponsor and general public) benefits from interacting with, and participating in, the process. First paragraph of the Stage II Jury report and recommendation to the US World War One Centennial Commission selecting a design team and concept. Something went wrong. Please check that you completed all the required fields. You may comment as often as you like. Your email, and comment are required for each submission. Help to honor our veterans of the past.